Have you ever struggled with a loss - no matter how big or small – a parent, friend, pet, a lost opportunity? 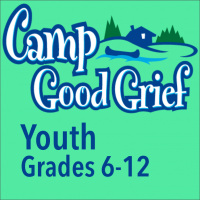 Our society isn’t very good at teaching us how to handle grief and loss, and that’s where good grief camp comes in. At camp, we’re going to have the opportunity to share in a lot of activities together to build up our skills and help cope with any grief or loss you have now or may have in the future. You’ll learn how your brain is wired to protect you from the worst, and learn how your brain, body and emotions can work together to help you cope more easily. Every activity is optional – and we hope you will come with an open mind and spirit. The camp leader is Dr. Howard Fradkin, who has 2 degrees in “camping” (therapeutic recreation bachelors and Masters) and a PhD in counseling psychology. He’s been helping people grieve for 37 years as a psychologist, and assisted by youth ministry staff, we will guide to each step of the way. Camp begins on March 31.